If in my last post, I wrote about a mild tasting fruit, this one is jammed packed with flavor. 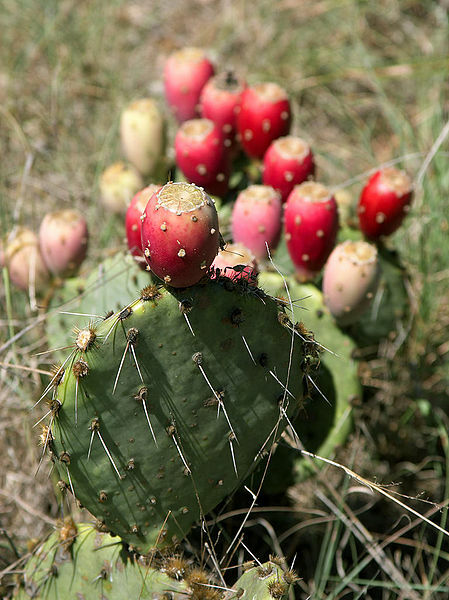 The opuntia or, colloquially known as the prickly pear, comes from a more flattened cactus with each ‘branch’ looking like a prickly balloon, with the fruit growing out like fingers. Various species can found across the Americas (especially Mexico), Mediterranean, Africa and Australia. I have never tried picking wild ones, and I wouldn’t recommend to unless you have the tools (minimally very thick gloves) and some mad skills. I leave the picking of the fruit to the professionals who are able to remove the prickly bits. Even when they are removed… there are sometimes tiny ones that feel like a splinter. Once you remove the outer skin, the red, sweet and very seed filled flesh is heaven. The fruit can be consumed as is, though it is sometimes used in jams/jellies, alcohol and candies. It is also used as a traditional dye, which is not surprising considering the stained t-shirt I have from one careless encounter. They are something like pomegranates with what it does to clothes, but it was still worth the damage.